Heerbrugg, Switzerland) 15 years of experience with hand-held laser distance meters and the latest technology are invested in the new Leica DISTO ™ D8. Equipped with a digital Pointfinder, high-resolution 2.4" colour display, 360o tilt sensor and bluetooth® technology, the Leica DISTO ™ D8 is a real world first and offers completely new measuring options. The in-built tilt sensor does more than just determine angles. As mentioned above, the combination of angle and distance measurement opens up completely new measuring possibilities. Such as being able to quickly and efficiently determine horizontal distances over the top of obstructions, or the height of a tree, even though it has no reflective points. Roof slopes and facade areas can be safely and rapidly measured from the ground. The Leica DISTO ™ D8 is even capable of simple leveling tasks, digitally and without the support of a second person. Measurement results can be transferred wirelessly and without errors to pocket-PCs or PCs using the integral bluetooth® technology, where they can be further processed quite easily in Excel®, AutoCAD® or other software. The AutoCAD® plug-in provides a convenient means of using the data for designing and drawing in AutoCAD®. The digital Pointfinder with 4x zoom allows you to point quickly and easily at far-off objects, in bright sunlight too. Even when the laser dot is no longer visible to the naked eye, the target can be clearly seen on the 2.4" high resolution colour display, allowing absolutely precise distance measurements to be made, even over great distances. 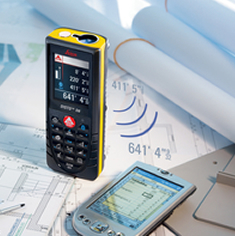 Despite its wealth of functions, the Leica DISTO ™ D8 is simple to operate thanks to its optimised user interface. And extremely handy; it can easily fit into any pocket. Its robust design with IP 54 protection keeps out dust and splash-water. This instrument completes the product family of laser distance meters. With its introduction, Leica Geosystems highlights the innovative power of the company and establishes a new benchmark in the world of measuring. Leica DISTO ™ stands for high quality. Leica Geosystems offers a 3-year warranty on all Leica DISTO ™ instruments if you register at www.disto.com within 8 weeks of the date of purchase. For more information and to purchase the new Leica Disto D8 see here >> or call 0800 292 2188 for technical and sale assistance.